It’s time to go green! Party down! And get your drink on! This cake is a win for all of the above. 😉 So let’s sit back unwind and enjoy some St. Patrick’s Day festivities. 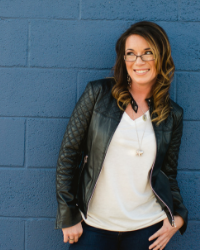 Now, on to my latest obsession…. layer cakes. Well, I’m not sure three in two weeks makes an obsession, but it sure feels like it! Preheat oven to 325 degrees F. Butter three 8-inch cake pans, line the bottoms with parchment paper and butter the parchment. Dust with flour and knock out any excess. In a medium bowl, combine the cocoa powder, hot water, sour cream and whisk to combine. Set aside to cool. Sift the flour, baking powder, soda, and salt together into a medium bowl and set aside. In the bowl of a stand mixer fitted with the paddle attachment, beat the butter and vegetable shortening on medium speed until light and fluffy, about 5 minutes. Add the sugars and beat until fluffy again, another 5 minutes. Add the eggs, one at a time, beating well after each addition. Add the vanilla and beat until incorporated, about 30 seconds longer. Scrape down the sides with a rubber spatula. Add the flour mixture alternating with the cocoa mixture to the butter sugar mixture, in three additions, beginning and ending with the flour mixture. Divide the batter among the prepared pans and smooth tops (I do this by wiggling the pan back and forth gently). Bake for 35 to 40 minutes, rotating pans halfway through the baking time, until a toothpick inserted comes out clean. Transfer the cakes to a wire rack and let cool for 20 minutes. Invert the cake pans onto the rack, remove the pans and parchment, and let cool for completely before assembling the cake. In a medium heavy-bottomed saucepan, whisk the sugar and flour together. Add the milk and cream and cook over medium heat, whisking occasionally, until the mixture comes to a boil and has thickened, about 20 minutes (whisk more towards the last few minutes to prevent any burning). Transfer the mixture to the bowl of a stand mixer fitted with the paddle attachment and beat on high until cool (you may want to cover your mixer with a kitchen towel before turning it on, in case of splatters). Reduce the speed to low and add the butter; mix until thoroughly incorporated. Increase the speed to medium-high and beat until the frosting is light and fluffy. Add the creme de menthe and peppermint extract and mix until combined. If the frosting is too soft, place it in the fridge to shill slightly. If it is too firm, set the bowl over a pot of simmering water and mix. Leave the buttercream at room temperature while you make the ganache. Put the chocolate in a medium heatproof bowl; set aside. In a small saucepan over medium heat, bring the cream just to a boil. Remove from the heat and pour over the chocolate. Let the cream sit for 2 minutes, then, starting at the center of the bowl and working your way out, slowly stir the chocolate and cream mixture in a circle until the chocolate is completely melted and the mixture is smooth. Add the creme de menthe and peppermint extract and stir until combined. Whisk for another few minutes to cool the ganache slightly, then let the ganache come to room temperature, about 15 minutes, stirring occasionally. Place one cake layer on a serving platter. Trim the top to create a flat surface. Use an offset spatula to spread about 1/4 cup of the ganache on the top of the layer. Place the cake in the fridge to set for about 1 minute. Remove from fridge and spread about 1 1/4 cups buttercream on top of the ganache, Top with the next layer, trim and frost with ganache and buttercream using same steps as before. Add the third layer and trim. Crumb coat the cake and put in the fridge for 15 minutes to firm up. Frost the side and top with remaining buttercream. 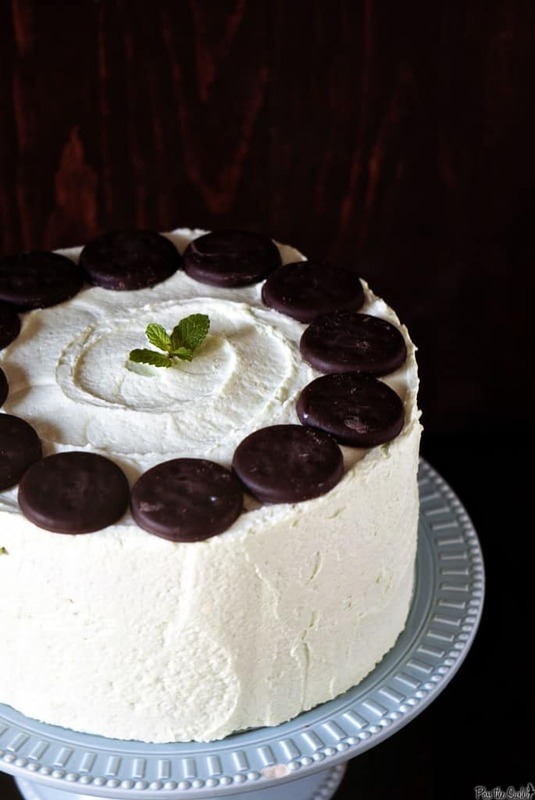 Garnish cake with Thin Mint cookies if desired. Refrigerate 15 minutes to firm up the finished cake. The cake will keep in a cake saver at room temperature for up to 3 days. If your room is not cool, place the cake in a cake server and in the fridge for up to 3 days. Remove cake from fridge and let sit at room temperature at least 2 hours before serving. Check out these other St. Patty’s inspired posts… ok, not really, but some are green and some have alcohol – #winning. On a completely unrelated note, the cost of first class stamps is now $0.41 cents. The look on your cats face when she somehow magically gets them stuck to her – Priceless. Oh, grasshoppper…=) What a stunning work of art! I’d like the BIG slice! This cake sounds absolutely lovely! Awesome idea. What a stunning cake, Kita! My kids would LOVE if I made this…pure heaven! Delicious and beautiful! I love making layer cakes too, though more often than not I downgrade to cupcakes to save time and hair-pulling. I love how easy you make it look to get a smooth layer of frosting! Hahaha omg please tell me you took a picture of the stamps on your cats face!? Too stinking adorable. Oh and btw, way to make me want a dessert with mint in it. That never happens. That cake looks awesome. Your frosting skills rock, the cake is so nice and smooth. I love chocolate and mint together. I see me trying this in the near future. Gorgeous! You clearly have a gift for making beautiful layer cakes! I love the Baked books, their recipes always turn out fantastic. Love, Love this cake! I don’t really like to make cakes. They never turn out pretty. Your cake, however, is beautiful! 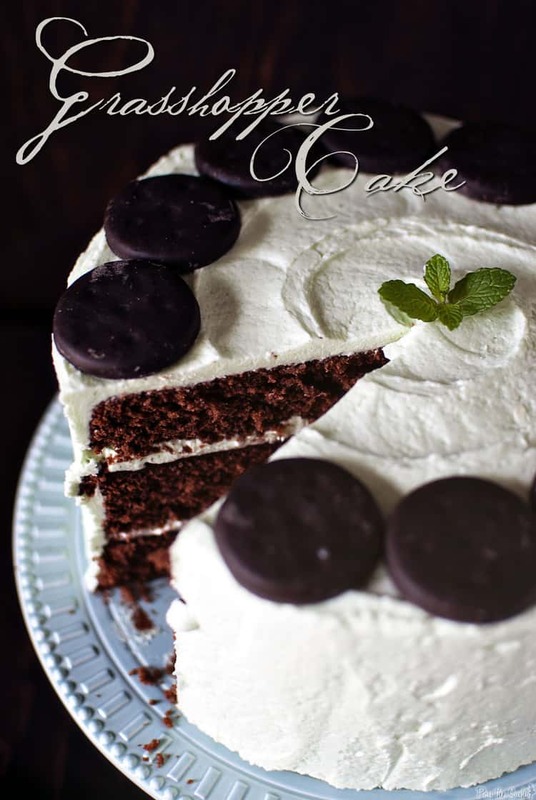 Oh cake….you are one talented lady and seeing a layer cake like this first thing in the morning makes me wish I had a bday party to look forward to 🙂 To my knowledge, I’ve never had a cake with mint chocolate ganache or minty buttercream, so I feel like taking a bite of this would feel clean, refreshing but rich at the same time. And you’ve got it goin on with those thin mints on top! You did such a nice job!! I love the way you did it. As always your pictures are stunning. nice job! The cake looks gorgeous. Stunning photos! Wow!! Wow!! Wow!!! Beautiful, stunning shots. Goodness… I love cakes but I simply don’t have the patience to make them. Girls in my girl scout troop made theirs look more professional than I do!! Well done. And I could hear you saying “Grasshopper” as I read it! What Kim said. Tripled. Amazing. I can’t say that baking will ever be my passion, but there definitely is something that just makes you feel good after making a layer cake (especially 3 layers like this one). It’s so satisfying. That Grasshopper cake is gorgeous. Absolutely stunning. This cake is an absolute stunner! 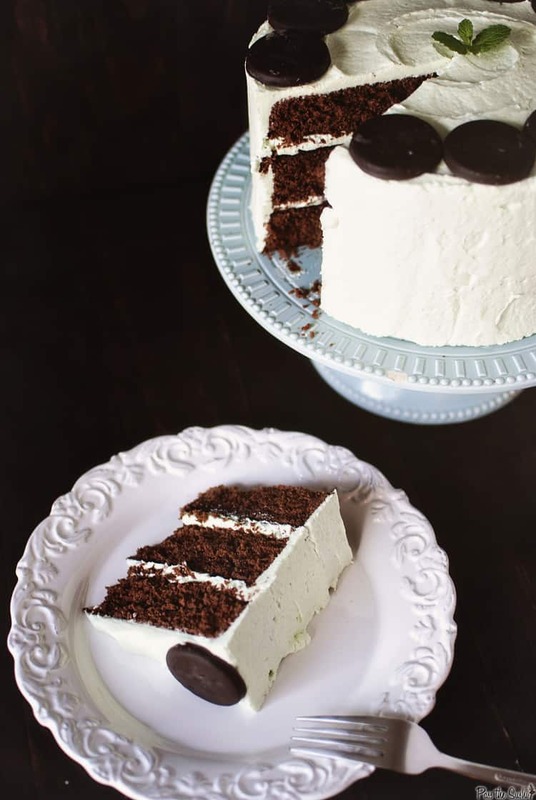 Pinning it… And I love all things minty and that butter cream is calling out to me! Great job with this one! Ooooo Ill take a slice, or two…. Oh Kita, this is a lovely cake. Mint and chocolate goes so perfect. beautiful cake! i totally wish i could have a piece right now! Gorgeous cake! I’m pretty much obsessed with layer cakes too 🙂 I just wish I had more excuses to make them! Yours sounds too good! I think this cake must be EVERY man’s dream! What a perrrfect dessert for Mister Saint Patty! Yummm… chocolate and mint.. I can think of no better combination! What a gorgeous looking cake! I’m bookmarking this recipe. 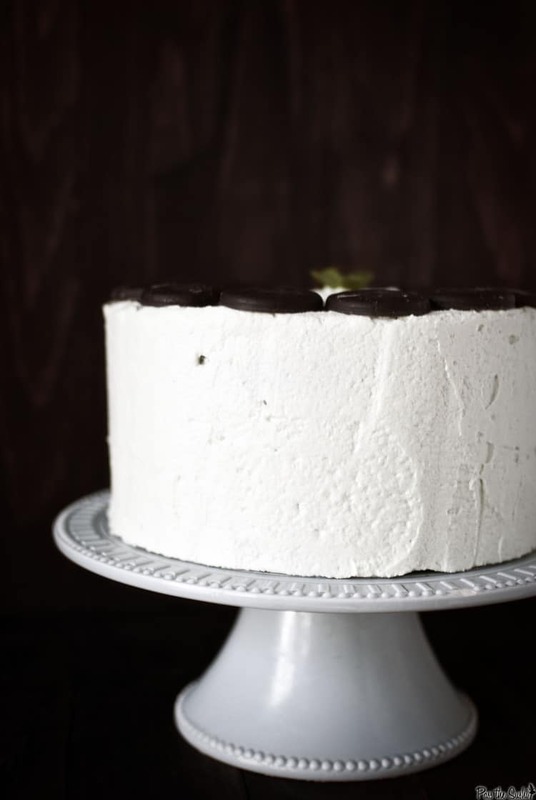 The cake, buttercream and ganache all sound wonderful. oo I love mint and chocolate combo! I found your website via Pinterest and I am planning on making this cake for my husband’s birthday this weekend. I was searching for the perfect recipe for the Thin Mints I’ve been hiding in the pantry! Quick question though….I only have 2 cake pans, and your recipe calls for 3. Can I make this in 2 cake pans and just have 2 thicker layers? Thanks in advance! Hi Jessica! I am not a pro baker by any means! I would think you could bake this in two taller cake pans and adjust the time, or bake the 2, and just wait until the pan has cooled to repeat and bake the third layer. Please let me know how it turns out! How long did you beat the frosting for? Did you continue using the paddle to beat the frosting? Mine did not turn fluffy at all, it seemed to stay kind of syrupy like it was in the sauce-pan and I’m not sure what happened. Hey Andrea, I don’t recall exactly how long I mixed it for, but I do remember it being a LOOOOONG time and feeling like it was never going to come together. Let me know how it came out!